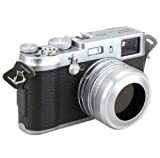 Premium replacement lens cover for the Fujifilm AR-X100 Silver lens cover. Suitable for Fuji Finepix X100, X100S. Manufactured in strong aluminum and the inner side has an anti-glare coating to avoid reflections. This entry was posted in Discount Photography and tagged Fujifilm, Hood, lens, Silver, X100, X100s, X100T by Ball Photo. Bookmark the permalink.